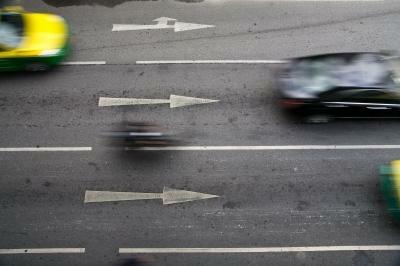 Three years ago a blistering assessment by a national advocacy group prompted the Florida Department of Transportation to get serious about making the state’s roadways safer for pedestrians and cyclists. After four Florida metropolitan areas were ranked as the most dangerous for pedestrians, FDOT leaders began to consider making design changes such as building narrower lanes. Proponents of narrower lanes argue that wide, open lanes encourage motorists to hit the gas and endanger pedestrians, while narrow lanes force motorists to slow down. So when Smart Growth America’s 2011 Dangerous by Design report named Orlando the most dangerous and Miami came in fourth, state officials knew they had to do something. Alton Road in Miami Beach is one of the thoroughfares facing changes through FDOT's complete streets program. Press listen to hear the audio version of this story. FDOT Secretary Anath Prasad lured District Secretary Billy Hattaway back to the agency from the private sector after that report was released. “He does not want our state on that list,” says Hattaway, who’s charged with leading the agency’s statewide initiative to improve pedestrian and cyclist safety. Now the agency is starting to make some changes to the way suburban streets and busy downtown corridors are designed. He stresses that he wants FDOT to think narrower when it comes to high-volume street design because, he says, wider lanes lead to more pedestrian fatalities. For Speck it's pretty simple: We determine how fast to drive based on our environment. "I believe the principal reason why there's such a high death rate among pedestrians in Florida is because so many of our downtown streets have been designed to highway standards,” says Speck. “Most of the major cities in Florida have state highways... running through their downtowns." 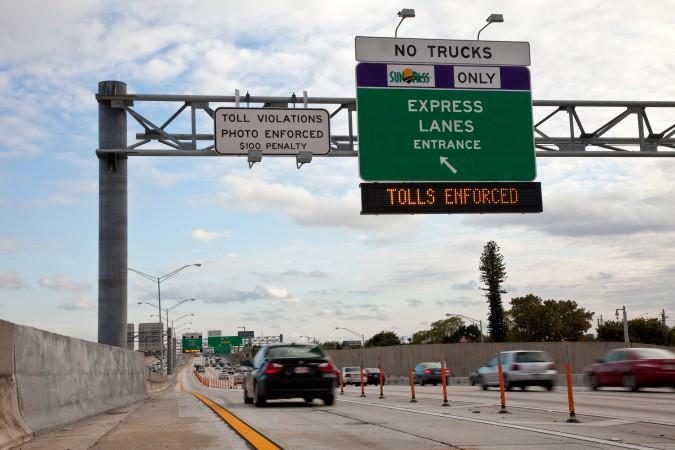 But that’s something FDOT hopes to change. In September, FDOT adopted a complete-streets policy that acknowledges the role of context in road design. Under the new policy, downtown city streets will no longer be designed like highways. The standard lane width is 12 feet, but FDOT is currently looking at high-capacity urban roads throughout the state to determine where 11 or 10 feet lanes might be appropriate. Hattaway says the 12-foot standard would generally remain for rural roads and those with speed limits of 45 miles-per-hour or more, but suburban streets could see an 11-foot standard and downtown thoroughfares could drop down to 10 with a few exceptions. 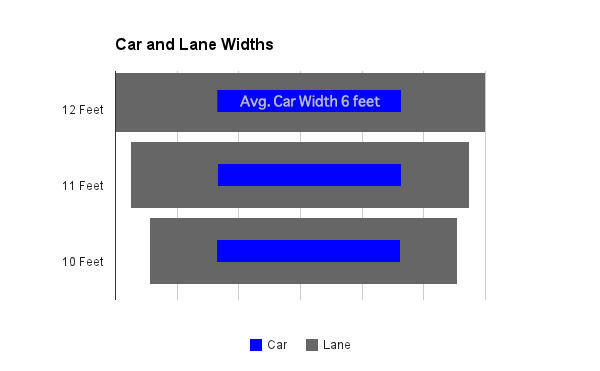 The blue bar represents the width of a Toyota Camry, a popular sedan, compared against the standard 12-foot lane and proposed narrower lanes. But for this to work, Hattaway says, local governments need to consider urban design changes as well. He blames land development patterns “where all of the developments were being ‘cul-de-saced’ onto the state road system” and says if “one neighborhood would have to connect to the next, which would have to connect to the next neighborhood, there wouldn't be so much pressure to widen our roads." FDOT’s plan also calls for what are known as road diets where say a six-lane road will become a four-lane road, and the agency is increasingly installing roundabouts. When Smart Growth America released its 2014 Dangerous by Design report, four Florida metropolitan areas still topped the list as the most dangerous for pedestrians. Miami remained fourth on the list, and Orlando still came out on top. Hattaway acknowledges that it will take time for the new safety measures to have a measurable impact, but he says FDOT is committed to the effort. Drivers complain about cyclists taking over the road. Cyclists complain about drivers not sharing the road. Pedestrians are afraid of getting hit while crossing the road. Palm Beach County's police department and the Florida Highway Patrol will be on the lookout this week to make sure everyone's following the rules. It's the second time police take over to make sure everyone's behaving on the road. The first time around, police issued 148 warnings and 175 citations between Palm Beach and Hillsboro Beach. 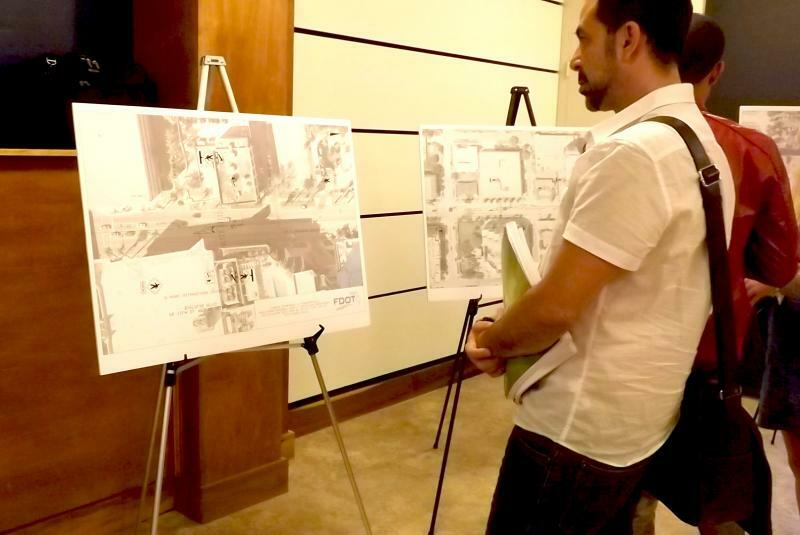 The Florida Department of Transportation has pedestrians in mind with a new plan for Biscayne Blvd. FDOT estimates it will spend upwards of $780,000 on new crosswalks and sidewalks along the busy road. Construction will span 3.9 miles from northeast 16 to northeast 74 street. “Everyday on the news you always see there is a pedestrian hit by a car – a lot of people don’t follow the rules,” says community member Malcolm Moyes, who thinks the additions will favor area pedestrians. There’s a good chance you’ve seen the work of Elisabeth Hassett and an equally good chance you didn’t really notice it. Hassett is the landscape architect for the Florida Department of Transportation’s District 4, which includes Broward and Palm Beach Counties. When there’s a need for highway-side landscape design, Hassett has almost definitely had a hand in choosing the plants and the layout -- a far more complicated art than you might imagine.